Fooditka: Bar 36 - Is It Closing? 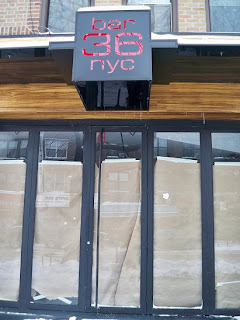 Bar 36 - Is It Closing? If you know more, please drop me a note. They may be switching management or owners. I think he got in over his head considering rents are so high on 30th ave. You may not know this but he also took over the lease next door where the furniture store used to be. That space is about the same size and I assume he may plan on renovating that space to combine it with the original next to it which would make a very spacious place. But despite the hip interior this place never really caught on. I hope they can do something and that yet another greek cafe doesn't take over! I think we could use a little more variety on that block. Thanks for the insider scoop!